We audit our security systems and processes on a regular basis. While we take commercially reasonable measures to maintain a secure site, electronic communications and databases are subject to errors, tampering and break-ins, and we cannot guarantee or warrant that such events will not take place and we will not be liable to Visitors or Authorized Customers for any such occurances. We may collect basic user profile information or Personally Identifiable Information from all of our Visitors. Personally identifiable information refers to any information that identifies or can be used to identify, contact, or locate the person to whom such information pertains, including but not limited to name, address, phone number, fax number or email address. Personally identifiable information does not include information that is collected anonymously (that is, without identification of the individual user) or demographic information not connected to an identified individual. Not all advanced features and tracking methods are necessarily enabled or configured for this site. Add This is a sharing platform which makes sharing content on the web easy. For more details on information they may collect please review their information page as well as the Add This Privacy Page. 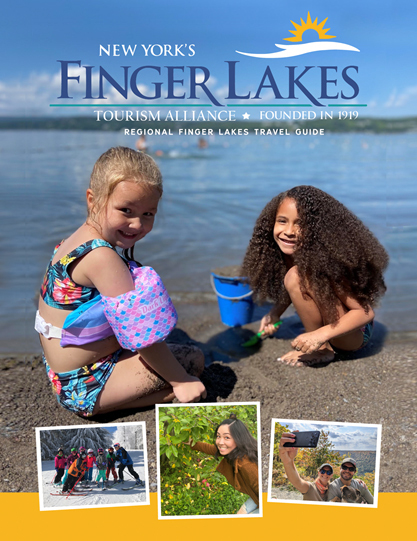 The Finger Lakes Tourism Alliance uses login information, including but not limited to, IP addresses, ISPs, and browser types, to analyze trends, administer the Site, track a user's movement and use, and gather broad demographic information. We will disclose Personally Identifiable Information in order to comply with a court order to subpoena or request from a law enforcement agency to release information. We will also disclose Personally Identifiable Information when reasonably necessary to protect the safety of our Visitors and Authorized Customers.